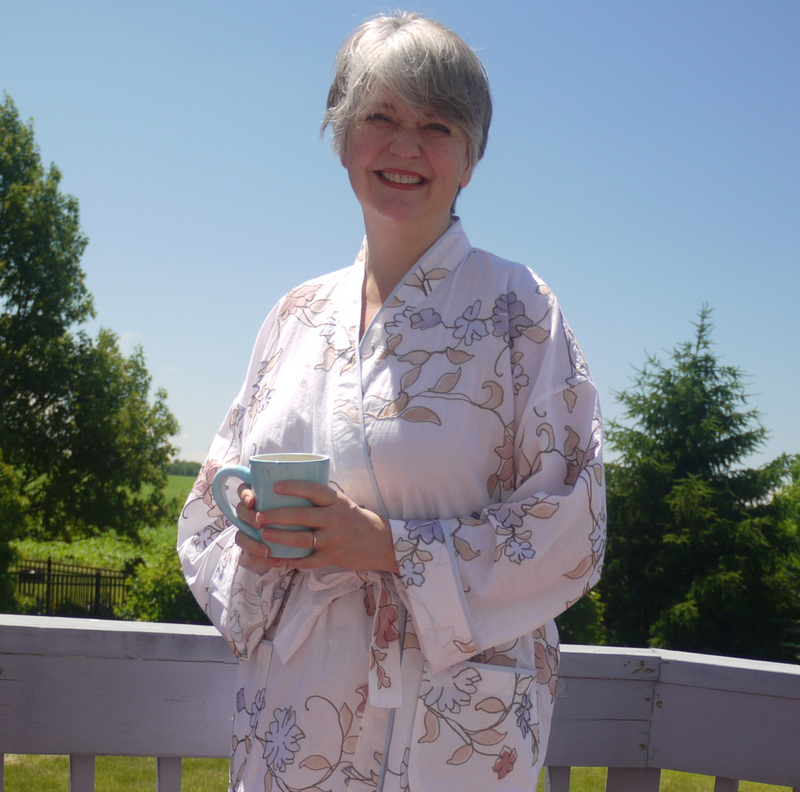 What could be better on a June day than having breakfast outside in your favorite pajamas and robe? Enjoying the sounds of the birds and the wind in the trees. Ahh... bliss. When I think about how much time I spend in my pajamas and robe, I realize that I get more wear out of them, than any other items in my wardrobe! I made these summer pajamas two years ago, and have worn them out, so it's time to make a new set! 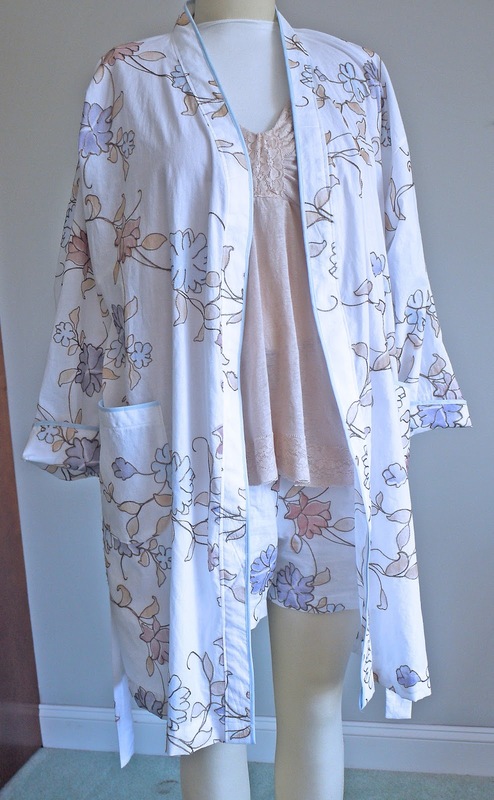 I wanted something super light and airy, and all natural fibers, so I chose an embroidered cotton voile for the robe and shorts, and a dusty pink linen knit for the top. For the pattern, I used McCalls 5769, a now out of print pattern, but a good one if you can find it. Let's start with the robe. This is a really basic pattern with dropped shoulders, a tie, pockets and a band. Super simple, and even a beginner could make this. I used a narrow double fold bias tape in light blue all around the front band, pocket top, and cuffs. This is actually much easier than piping. You just put it over the edge and stitch in it place. One package was enough for the whole robe. 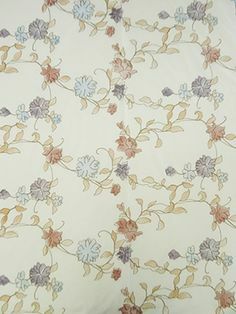 You can see how unique this fabric is- the flowers are almost painted on like a watercolor, and then they are outlined in a chain stitch embroidery. Really soft and pretty! 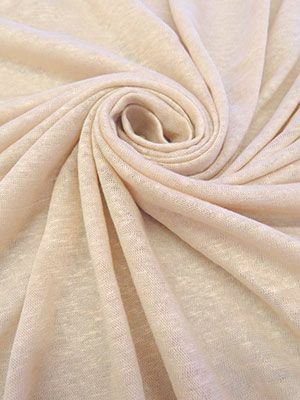 I always use a lightweight interfacing in pockets- it stops them from stretching out and eliminates any show through on a thin fabric. Next, on to the top. The pattern was designed for woven fabric, but I had a knit, so I used a size smaller than I normally would take, and that worked well. I had a small roll of stretch lace that I had purchased for a different project and it wasn't the right color for it. Imagine my delight when I saw this fabric was a perfect match for this fabric! So, I used it on the neckline and hem. I used two strips of Lite Steam-A-Seam 2, which is a double sided lightweight adhesive to adhere it, instead of stitching. After you remove the paper backing, it's clear. 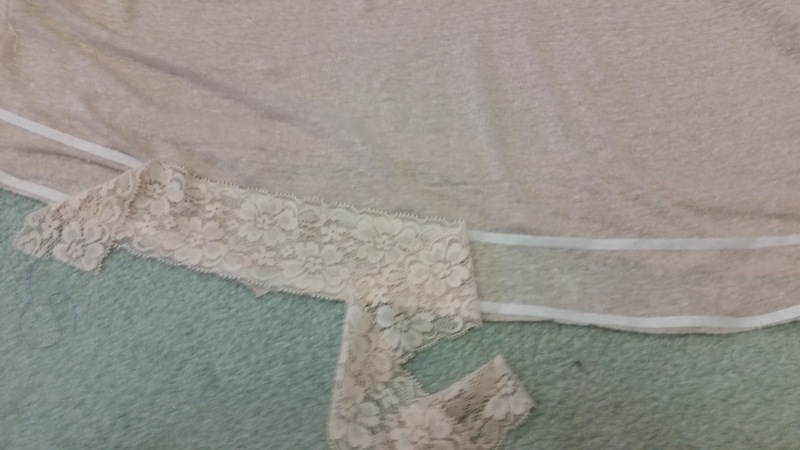 And a nice bonus, it serves as the hem edge, so I just made sure that the lace covered up the lower edge. This fabric was very stretchy, and without any lycra for recovery, so I knew that stabilizing the neck edge was going to be a challenge. I fused a small strip of 1/4" wide interfacing to the back neck edge. I decided to line the bodice front and back for modesty, as the fabric is also quite sheer. 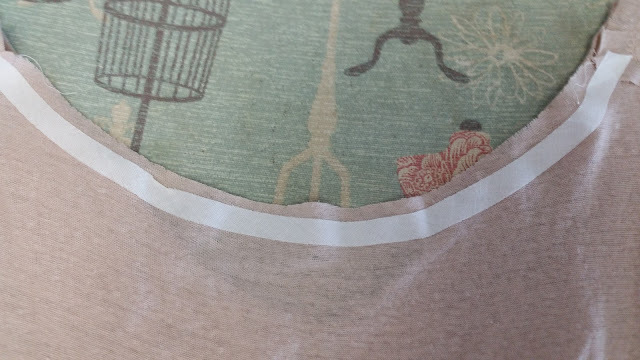 For the underarm edge that wasn't covered by the sleeve, I used a single fold bias tape, folded to the inside, which also stabilized the armhole. I had just enough fabric left over from the robe to make a pair of shorts to match. Since the fabric is so lightweight, I only needed 1/4" wide elastic at the waistband. I also made a test garment out of a white cotton knit to make sure that the top pattern was going to work for me. It turned out pretty well too! On this one, I sewed on strips of lace around the neck and just under the bodice. Then, I also used the ruffle piece at the underbust, and used a lettuce edge finish. I wish that I could tell you that this was fast, but it was not! These details do take some time, but they also elevate it to something nicer than your standard sleep shirt. I really love my new sleepwear set! Because the fabrics are so lightweight, it will be easy to pack up and travel with too. It's going to be tempting to wear this all day around the house. I would never be able to find something that I liked even half as much in a store, which is just one of the many reasons of why I love to sew! I never think about sewing these types of garments but I should. Great collection! Thanks Michelle! Yes, you should sew some too! They are a lot of fun to make. Very pretty. I agree that nice sleepwear is important, and yours is beautiful. Thanks, Sherry. I have a feeling that your daughters will be asking for more, so you should hide your next set! I have set aside some beautiful silks for such a set when my daughters reach that stage. Your sewing always inspires. Thanks for sharing.